Field Service Management can be defined as the managing of a company’s resources which may be en route or employed at client’s property, rather than company’s property. Among many examples of field service management, prominent ones are the locating of vehicles, scheduling and dispatching of work, managing worker’s activities, accounting, billing and so on. There are many benefits of field service management software. Some of these are growth in revenue, reduction of cost, better resource allocation and co-ordination. These software also take care of the billing, statement of work and provide oversight. Growing need for improved efficiency and migration to cloud are expected to be major drivers of the market. The market is also expected to grow from the high degree of technological advancements in developed and developing countries such as the U.S., the U.K., France, Germany, China and Japan among others. However, the market growth is expected to be hindered by the concerns over data security. Moreover, the market is expected to face restraint due to the growing costs of field service management solutions. The global field service management market is expected to expand at a CAGR of 14.1% during the forecast period of 2017 to 2025 and reach US$ 8,593.6 Mn in 2025. The global field service management market is segmented on the basis of solution, service, deployment type, user type and industry vertical. On the basis of solution, the market is segmented into billing and invoicing, inventory management, mobile field execution, reporting and dashboards, schedule and dispatch, tracking and performance management, and work order management. The work order management sub-segment is expected to hold a major share of the market while inventory management is anticipated to grow at a substantial pace. On the basis of service, the market is segmented into consulting, implementation, and training and support. On the basis of deployment type, the market is segmented into cloud and on-premise. Based on user type, the market is segmented into small and medium enterprise (SME) and large enterprise. On the basis of industry vertical, the market is segmented into BFSI, construction and real estate, energy and utilities, healthcare, manufacturing, telecom and IT, transportation and logistics, and others. The market on the basis of industry vertical is expected to be dominated by telecom and IT while manufacturing sub-segment is projected to grow at rapid pace. The global field service management market is expected to be driven by the North America region. North America is estimated to contribute a major share to the overall field service management market with the U.S. contributing most to the region’s revenue. The presence of major industry players along with high adoption of such software across many verticals is expected to drive the market in the region. The presence of necessary internet and communication infrastructure is also expected to bolster the market growth. North America is expected to be followed by Europe and Asia Pacific in terms of market share. Asia-Pacific region is expected to emerge as the fastest growing region for the field service management market. This growth is accountable from the countries such as China, Japan and India while South East Asian countries with the growing industrialization are also expected to contribute substantially to the region’s growth. Major players in the field service management market include Oracle Corporation, SAP SE, ClickSoftware Technologies Ltd., Astea International Inc., Coresystems AG and IFS AB (Industrial and Financial Systems). Other prominent players in the field service management market are Microsoft Corporation, Praxedo, Retriever Communications Pty Ltd. and ServiceMax, Inc. The report on the global field service management market provides analysis for the period 2015–2025, wherein 2016 is the base year and the period from 2017 to 2025 is the forecast period. Data for 2015 has been included as historical information. The report covers market dynamics including drivers, restraints opportunities, and trends expected to influence the global field service management market growth during the said period. Technologies that are playing a major role in driving the global field service management market have also been covered in the study. The study provides a comprehensive analysis on market growth throughout the above mentioned forecast period in terms of revenue estimates (In US$ Mn) across different geographies. Field Service Management can be defined as the managing of a company’s resources which may be en route or employed at client’s property, rather than company’s property. Among many examples of field service management, prominent ones are the locating of vehicles, scheduling and dispatching of work, managing worker’s activities, accounting, billing etc. There are many benefits of field service management software. Some of these are growth in revenue, reduction of cost, better resource allocation and co-ordination. These software also take care of the billing, statement of work and provide oversight. 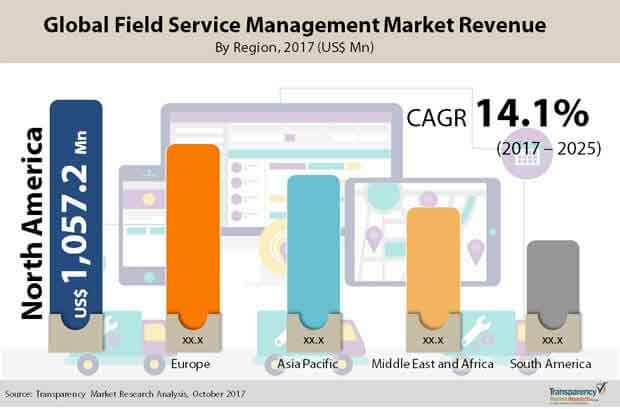 The global field service management market is segmented on the basis of solution, service, deployment type, user type and industry vertical. On the basis of solution, the market is segmented in to billing and invoicing, inventory management, mobile field execution, reporting and dashboards, schedule and dispatch, tracking and performance management, and work order management. In 2016 among the solution segment, the majority revenue share in the global field service management market was held by work order management sub-segment. The inventory management segment is expected to be the fastest growing segment during the forecast period. On the basis of service, the market is segmented in to consulting, implementation, and training and support. On the basis of deployment type, the market is segmented in to cloud and on-premises. In 2016, among the deployment type segment, on-premises sub-segment held the majority revenue share in the global field service management market. Based on user type, the market is segmented in to small and medium enterprise (SME) and large enterprise. On the basis of industry vertical, the market is segmented in to BFSI, construction and real estate, energy and utilities, healthcare, manufacturing, telecom and IT, transportation and logistics, and others. In 2016, the market on the basis of industry vertical was be dominated by telecom and IT while manufacturing sub-segment is projected to grow at rapid pace. Geographically, the report classifies the global field service management market into North America, Europe, Asia Pacific, Middle East & Africa (MEA), and South America; the regions are analyzed in terms of market revenue. Furthermore, region wise prominent countries covered in the report include the following - the U.S, Canada, Germany, France, the U.K., China, India, Japan, Gulf Cooperation Council (GCC), South Africa and Brazil. The report also describes key developments in the field service management market. Porter Five Force analysis and financials are included in the report. The report also covers segment wise comparison matrix, market attractiveness analysis and market share analysis for all regions covered in the scope of study. Comparison matrix includes segment growth matrix, 2015 - 2025 (%), segment value share contribution, 2015 - 2025 (%), and segment compounded growth matrix (CAGR %). Market attractiveness identifies and compares segments on the basis of CAGR and market share index. The competition landscape section in the report includes competition matrix, market share analysis of major players in the global field service management market based on their projected value share, and business profiling of major players. The competition matrix benchmarks leading players on the basis of their capabilities and potential to grow. Factors including market position, offerings and R&D focus are attributed to a company’s capabilities. Factors including top line growth, market share, segment growth, infrastructure facilities and future outlook are attributed to company’s potential to grow. This section also identifies and includes various recent developments with respect to the leading players.